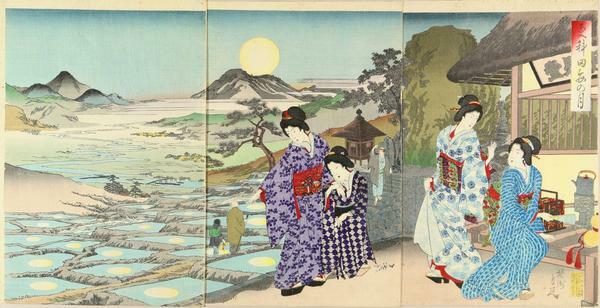 [Go Back] [New Search] Comparing Item Details for Chikanobu Yoshu (1838-1912) Toyohara "Moon reflected in the rice fields in Sarashina"
Format: Oban triptych: each sheet: 14" x 9.5"
Subject: Multiple reflections shimmer on the surface of the paddy fields at Sarashina. 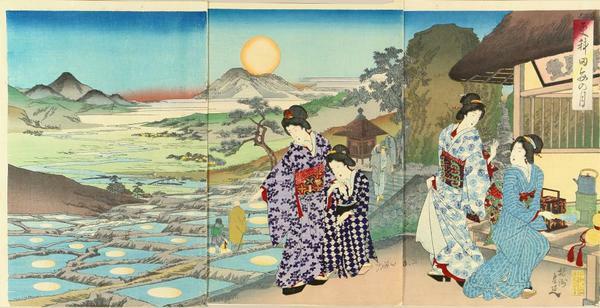 Chikanobu has borrowed Hiroshige's paddyfield design from the Provinces set for this delightful triptych. Condition: Fine colors. Slightly trimmed. Vertical centrefolds. 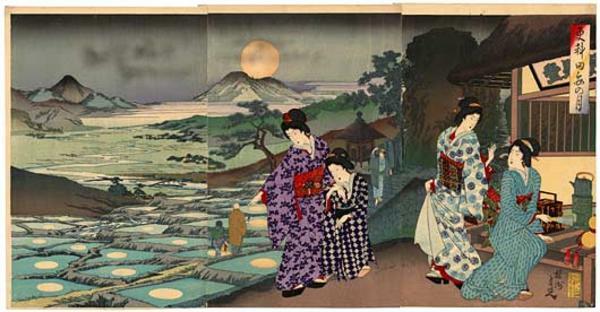 Album backing paper. Minor soils, marks and flaws. Generally good state. Impression: Fine impression with gauffrage and lacquer.